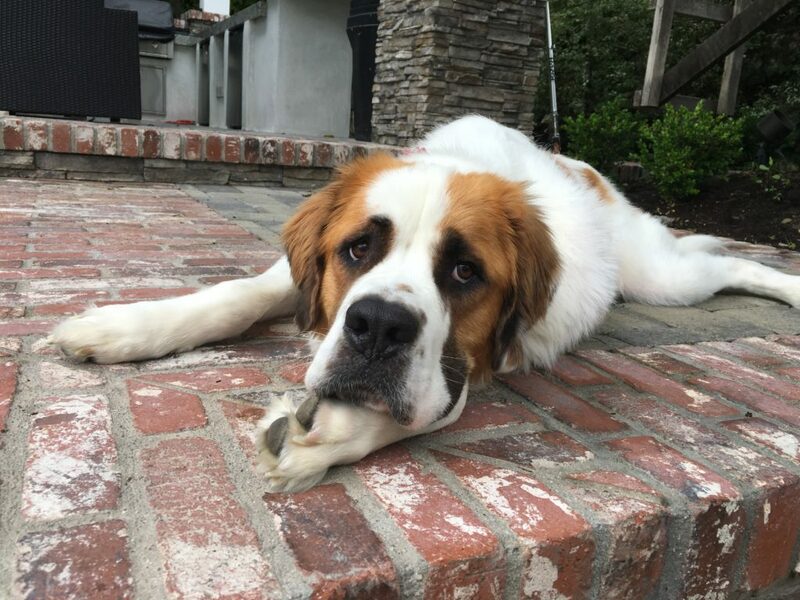 Dagny is two-year-old St Bernard who was recently rescued by long time friends of ours who live in Laguna Niguel. Her guardians asked me to help with a few unwanted behaviors; not always listening to them, pulling on the leash and her dog reactiveness on walks. When I first arrived and met Dagny for the first time, she was a little bit standoffish. She barked and stepped away and carried herself stiffly. Her guardians reported to me that this was a pretty normal behavior when she met men for the first time. I suggested that when new male guests arrive, her guardian give them four high value treats at the door and keep Dagny on a leash sitting in a chair on the far side of the room away from the entryway. The guest should walk in calmly and with a smooth casual gait, walk towards Dagny in a rounding (present shaped) path and drop the first treat when they turn to walk by her (so she is on their side), then drop two additional treats as they walk away to take a seat on the far side of the couch and remain sitting there calmly and quietly for a minute or two. They should also completely ignore her. No talking, attempts to pet or even eye contact. By ignoring her after dropping these treats, they can help her relax quicker. Only when she is relaxed will she go over an take up the treats. After she gobbled up the treats on the floor, she will likely come over to investigate the new guest. The guest should remain still and not try to pet or engage with her when she is sniffing them. When she finishes, they can offer her the last treat by extending it out to their right or left side with the treat in their hand with the palm facing the ceiling. Sideways is a less confrontational position for dogs. After a few new male guests enter this way, Dagny will get more comfortable with the ritual and in time, no longer be standoffish when strangers arrive. Development of respect for her guardians as authority figures will also help her be less reactive as she will essentially defer to their judgement to bring the person into their home. We sat down and chatted about Dagny’s adopt and her, rules and structure for a few minutes. In the course of this conversation I learned that Dagny understood and respected some rules already. Many of my clients fail to provide their dogs with rules, boundaries and structure and it results in the dog getting the impression that they have the same authority as the humans. But if a dog considers you it’s equal, then listening to you is optional on the dog’s part. This is why developing a healthy respect for the humans is so important when bringing a new dog into your home. Knowing Dagny’s guardians very well, I was not at all concerned about the dog not receiving the proper amount of love and attention. However I wanted to give them a trick that will help them develop a healthy leader follower dynamic every time they pet her. I call this technique Petting with a purpose. If the family members can get into a habit of only petting Dagny when she sits, comes to them or lays down while repeating the command word the instant that she does, they will unintentionally engage in a mini dog behavior training session every time they do. But as any dog guardian or parent knows, sometimes you have to actually say no or disagree. I spent the next few minutes going over a set of escalating consequences that I developed after years of observing how dogs communicate and interact with one another. At first Dagny’s guardians will need to use the full gamut of these escalating consequences, but as they become more proficient at using them with good timing (within the first one to two seconds of the dog engaging in the unwanted action or behavior) they will find that they need to use fewer and fewer of them until eventually a hiss alone will suffice. One of the big issues Dagny’s guardians wanted me to help them with was her reactivity when she saw other dogs while out on a walk. As this giant breed dog weighs more than everyone but the family’s father, it will be important that they help the dog develop a habit of checking in and watching them. I recently learned a new technique to help a dog focus on it’s handler and spent the next few minutes going over it with Dagny and her guardian. To be brutally honest, I was quite disappointed in my performance. While there were small periods of getting Dagny to pay attention to me, she consistently looked over towards her guardian and deviated from the position I intend to her to stay in throughout my demonstration. Fortunately, I was able to describe it with enough detail to make it easy for her guardian to understand the parameters of the exercise. And because the dog has such a deep love and bond for her guardian, she was able to get amazing results that far exceeded what I achieved. I suggested that Dagny’s guardians all practice this exercise every day for the next week or so. This will help the dog get used to following them and paying attention to them when on a leash. By practicing the behavior in their backyard, they can help the dog develop muscle memory of paying attention which will be extremely helpful when outside of the backyard and encountering an unknown dog. There are additional steps to this attention focusing exercise that I will go over with the family the next time I come and visit them. Another great way to help a dog stop being reactive when it sees other dogs on walks as a practice an exercise called the Watch that my mentor Karen London CAAB developed in her book Feisty Fido. As I have more experience teaching this technique, I was able to get a better response from Dagny. But once again, her guardian showed amazing responsiveness when she took over the exercise. People usually need several minutes to get the timing and delivery down, but her guardian caught on within seconds. If Dagny gets up and attempts to move away when the family members practice this exercise, they can incorporate a leash and step on it to block her from moving away. After a few days of practice, the leash should no longer be necessary. As we were wrapping up our discussion of the watch, Dagny’s guardian got up to get a drink of water. When she did, I witnessed the dog getting up and following her. Dagny did this to remain close to her despite the fact that the guardian only walked a few paces away to retrieve the glass of water. This can be an indicator of a dog that has lower self-esteem and in some dogs, that can develop into a case of separation anxiety. A great way to head off this problem is to help the dog develop self-control and confidence in being left alone. The best way to help a dog develop these skills is to teach it how to stay until given a release word. In the video I only demonstrated the first part of teaching Dagny to stay which is conditioning her for the first of three D’s; duration. Once they are able to help the dog stay for several minutes while right next to her, the next step will be to practice for duration and then eventually for distraction. If you are interested in getting more information on this stay technic, check out this YouTube video. Because Dagny has a bad habit of trying to race up the stairs when she knows her guardians are about to send them, I spent the next few minutes showing the guardian how she can train the dog to wait for her to get to the top or bottom of the stairs. One of the great things about Dagny’s placement with my friends family is how closely her energy level matches their lifestyle. I always tell people that the most important factor to consider when deciding on what type of dog to get is one that matches your energy level and lifestyle. But just because she is a medium energy dog does not mean that Dagny does not need to be walked. Walking, in a structured way with the dog in a heel, is a great way for the dog to develop more respect for their humans as authority figures. The more a dog respects their humans, the more they will count on them to handle things rather than trying to sort them out on their own. This is extremely helpful for a dog who is sometimes dog reactive. I fitted Dagny up with a Martingale collar and then showed the guardian how to add the special twist of the leash to give her more control and stop her pulling. We also took our time before we actually left the house. Many people mistakenly rush through this step and end up with a dog who is over excited and out of control for the duration of the walk. As a general rule, the dog is going to keep the same energy on the walk that they do when you put it on the leash. I usually recommend that people do not put the leash on the dog while the tail is wagging or its moving about. Additionally, it’s important that when we leave the house that the dog does not rush out the door ahead of us. To dog’s, whoever is in front is literally leading. And when a dog is in front of you on a leash, that position often makes it more reactive to approaching animals and people. Once we were outside, I took the leash and demonstrated the proper positioning and technique for correcting Dagny back into a heel position. Once we had finished going over the rules for the walk, I handed the leash back to her guardian so that she could practice leading Dagny herself. We did not encounter any other dogs on the walk which was a little bit disappointing for Dagny’s guardian. However at this stage in her training, it’s best that they avoid dogs for the time being. Once they practice the Watch, Follow and Stay exercises enough, Dagny will develop sufficient self-control and respect for the humans as authority figures. This will enable them to disagree with her anytime she starts to get excited and want to move towards other dogs. This is a good time to point out how important timing is when correcting a dog. Just like humans, dog’s get more worked up the more engaged they get. If you are monitoring your dog and you can disagree with it the instant it sees another dog and starts to get excited, it will be astronomically more effective than trying to disagree with the dog after it has gotten all worked up. These techniques will enable Dagny’s guardians to redirect her due to the positive reinforcement training her to listen and respond to them. Another great way to train a dog to do something on command is to immediately reward after it does it. A good example of this is the “down” command. While Dagny did lay down on occasion, she was not very consistent and her guardians often had to give her the command multiple times. Even then sometimes she just got up and walked away instead. I suggested that the guardians try to to pay close attention and immediately start petting her anytime that she lays down on her own. If they can start petting her while repeating the command word of “chill” within one or two seconds of her laying down, eventually she will start to associate the word with the act. Once this is the case, the command word will elicit the desired response from the dog. As I was preparing to leave Laguna to return to Los Angeles, Dagny’s neighbor came out with her dog; a beautiful Goldendoodle named Dutch. I had heard Dutch barking from behind the fence on several previous visits but I’d never actually seen him in person. I noticed that the guardian had incorporated. a prong collar to give her more control but also noticed that the dog was still pulling her rather than listening or following her lead. Long term use of these collars can cause stress, anxiety and frustration in the dog that can lead to other issues. I pulled out a Martingale collar and showed Dutch’s guardian how she could use it to have more control of her dog without using such a harsh collar like a prong, which is banned in many countries like the United Kingdom. After spending a few minutes going over the proper technique and corrections for using the Martingale collar, the guardian lamented that she wish there was another dog nearby so that I could witness her dog’s response. I decided to head inside and grab Dagny so that we could introduce the dogs properly. At first, both dogs barked at one another and kept distance other then a faint here or there. Because Dutch was more reactive than Dagny, we switched leashes and set out for a short walk around the block. At first we kept the dogs about 15 feet apart as we walked down the street. When a dog is reactive, increasing the distance between them and whatever it is they are reacting to can help them relax and settle down. Once they calmed down, we gradually collapsed the distance between us until I was walking shoulders to shoulder with Dutch’s guardian with the dog’s on opposite sides. As we were getting back towards the dog’s homes, they were both very relaxed so I decided to take them both into Dagny’s backyard. This way we could let them have a little bit of off leash playtime together and really cement a positive association. I was quite pleased that I was able to facilitate the introduction between Dagny and Dutch. Being of similar size and such close proximity, there’s no reason these dog should not be best of friends. I’m so pleased that Dagny is the dog my friends family adopted. She is a great match for them and I know this will be a great relationship for all parties involved. We covered a lot of ground in the session and so as we were wrapping things up I advised the guardian to focus on a few things at a time and really master them before tackling other techniques and exercises. Many people have a tendency to practice things only partway and this does not help the dog fully develop the skills necessary to put them in a position to succeed. Luckily for Dagny, her guardians are not only persistent but they are determined to help her build up her confidence, leadership and obedience. I suggested that the family’s two beautiful daughters search youtube for four dog tricks or commands and that they take turns teaching her a new trick or command each week for this summer. This will help the dog develop more respect for the girls as authority figures while also deepening the bond they share. This way the girls can play a big role in restoring Dagny’s confidence and self esteem. Once she is completely confident and has mastered the skills and exercises we went over in this session, her dog reactivity, leash pulling and occasional failure to listen should abate for good.